Professional fiber optic engineering and installation will ensure that you have a successful network, but there is nothing you can do when a construction company comes and slices through your fiber, or when Mother Nature throws you a curve-ball, or in the event of a natural disaster — You should always be prepared and have a plan of action in the event of a network outage. 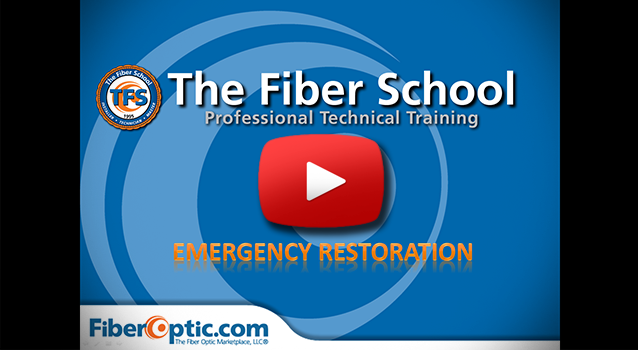 In this video, the Fiber School’s Senior Instructor, Terry Power, will provide you with essential information for effective planning. Topics include identifying the cause of the failure, necessary restoration tools and accurate record keeping and documentation. We would like to hear your feedback on the Emergency Restoration Webinar. If you could please fill out the evaluation form located here: http://learnfiberoptic.com/webinar-evaluation/ and let us know your thoughts. Thanks and we’ll see you next time!